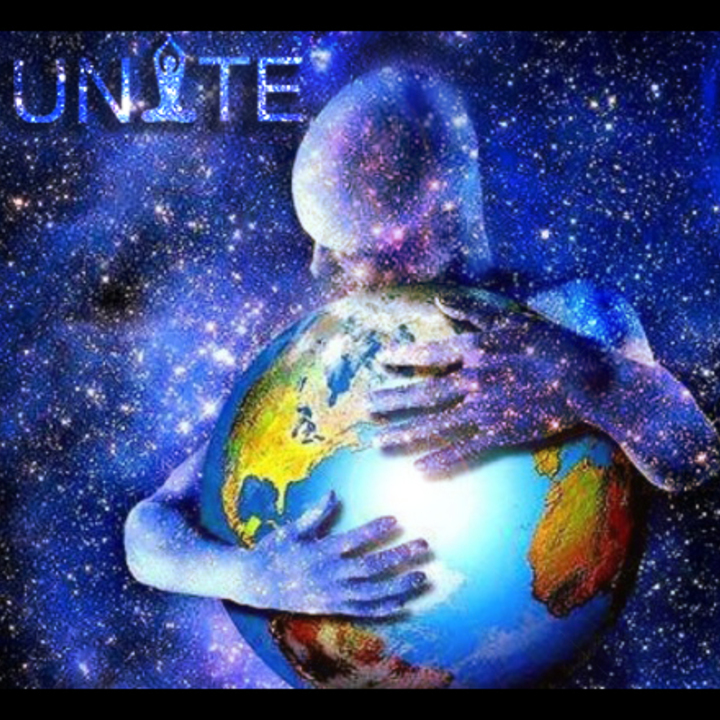 EVOLVING HUMANITY ~ UNITE CENTRE VANCOUVER! by IMAGINAL ENTERTAINMENT INC. 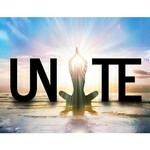 EVOLVING HUMANITY ~ UNITE CENTRE VANCOUVER! IMAGINAL ENTERTAINMENT INC. hasn't added a story. We are the founders of UNITE. Both having lost our fathers at a young age, to cancer and mental health challenges resulting in suicide, we saw first hand how these situations can impact families & communities. We learned early on the importance of emotional & mental wellbeing. Cancer, suicide, depression, & mental health challenges affect many people's lives, and we believe they are rooted in our past limiting beliefs & traumas. Both personal practices, as well as community, play a huge role in a healthy lifestyle. We are committed to creating spaces that provide a platform to connect & share leading edge tools to live a happy, fulfilled life! 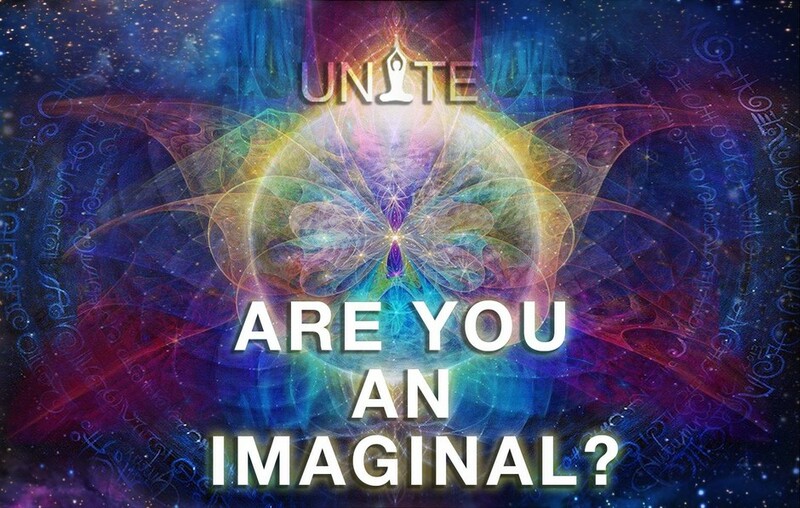 UNITE is a community of IMAGINALS (humanitarians, visionaries, artists, changemakers etc...) working together towards creating a world full of love, joy, happiness, & abundance. To uplift humanity & elevating consciousness, UNITING individuals & businesses, working together harmoniously, creating a thriving world! 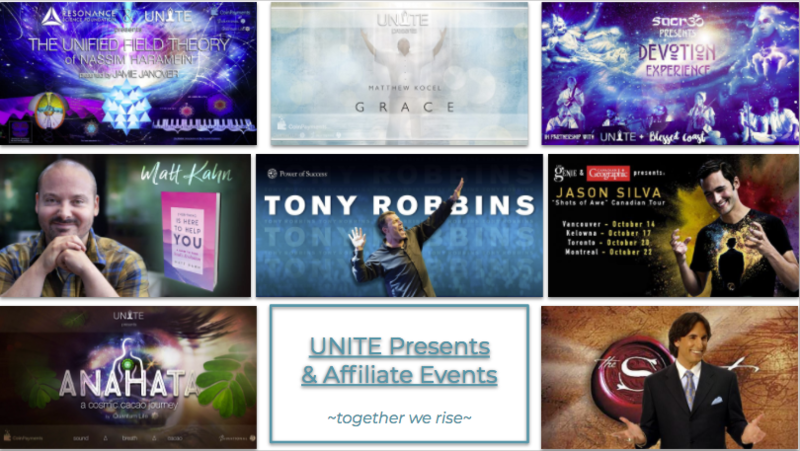 With our community’s support over the past 2 years, we have created over 80 uplifting events, featuring local & global presenters, with 6000+ attendees, reaching over 650,000 people worldwide! 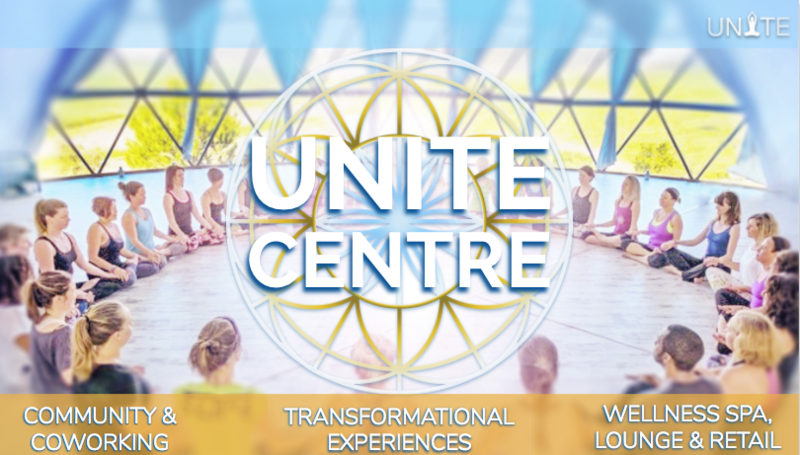 ANNOUNCING OUR UNITE CENTRE FUNDRAISING CAMPAIGN! When you support, you are contributing to a more aligned, inclusive, integrated & preventive social system, and getting well while you do it. You will be supporting in the creation of a place to UNITE different forces; spaces that are conducive to alignment, where each aspect supports and builds on each other, like permaculture for humanity! Choose one or more of the perks to the right, or simply donate. We are excited to launch our equity crowdfunding campaign soon to possibly buy the building as we will be making significant renovations, and it offers real estate investors an opportunity to own a portion of a building. A similar project in New York ( www.theassemblage.com ) has recently raised a significant amount of money through these means to buy three large buildings. This funding will help us develop a comprehensive strategy for assembling the necessary teams & resources to launch UNITE Centers around the world, starting in Vancouver. We will produce fundraising materials to raise the additional funds needed, & engage a team to support. We saw a need for support & connection in Vancouver. A big city that feels cold, lonely & disconnected to some. 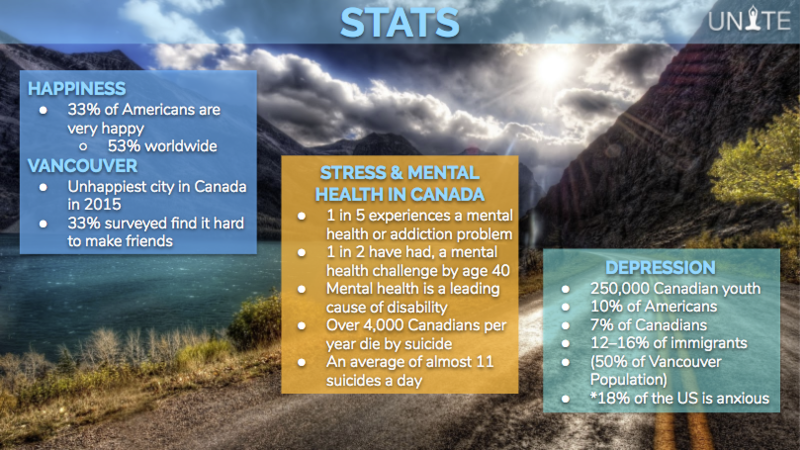 Many are overwhelmed with stress & mental health issues (like depression). Vancouver was ranked the unhappiest city in Canada in 2015, despite the many uplifting & supportive events & people in the city. Perhaps some have a fear of trying new things, or feel challenged to change their state and connect with others. Without a unified platform to support, create & curate events, and showcase wellness products & services, it can be difficult to find what would be most beneficial for optimal wellness. Like a puzzle has all the pieces in the box, so do we as humanity have all the resources to provide solutions and create a thriving world. UNITE’s core team of lifelong community builders recognizes this need & are committed to providing these solutions. 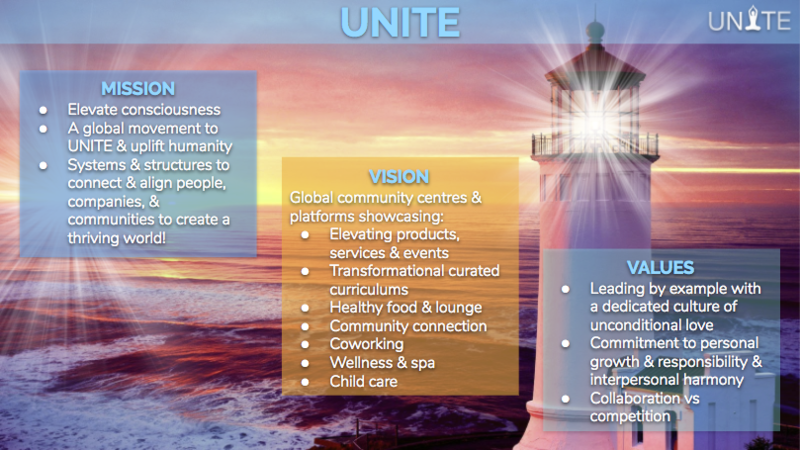 UNITE will provide a space for the healthy living, meditation, mindfulness, & entrepreneurial communities. 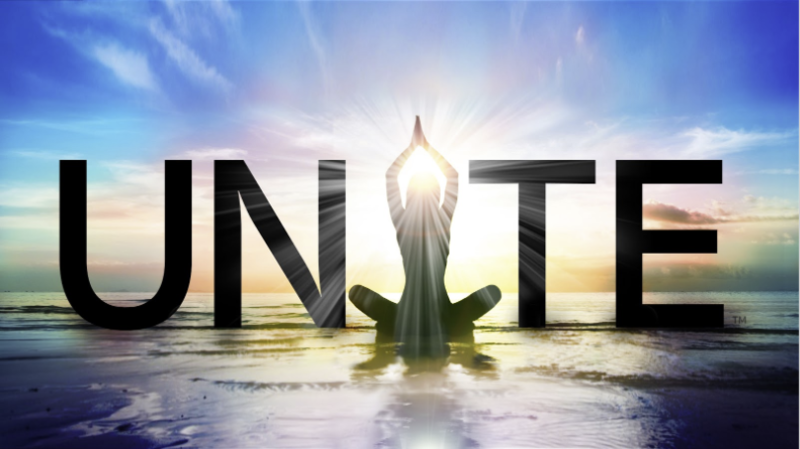 There we will work together to uplevel our own lives, unite around new projects, and provide space for more people to access daily personal development classes, breathwork, emotional work, meditation, mindfulness, wellness products & services, and more. Led by a team of health & happiness focused entrepreneurs, meditators, & yogis who lead by example, making a positive difference in the world. We are offering a community approach to wellness and sustainability, providing lasting solutions. Expertly designed for comfort and connecting. Easy to make new friends! Nurturing the community with health focused sustainable natural food and drinks. As well as ability to sample and try out epic products and wellness tools in the retail store. Feeding business and minds; rent a desk in our coworking space & enjoy the powerful energy & co-creative potential present in a space with everything one needs for a productive & vibrant day! Feel like a superhero, knowing you have made a difference in the world. By voting with your dollar, and your heart, for something that truly matters, and is addressing humanity’s core challenges, changing the world we see, into the world we know it can be. 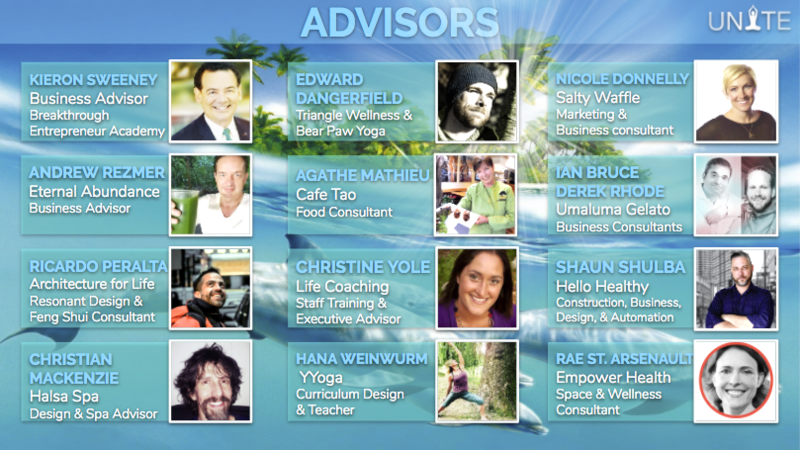 Providing Vancouver with a one stop shop for everything needed for a holistic, healthy, love field life. We see these Centres as central to the health & wellbeing of any community, bringing back the village, like facebook HQ! 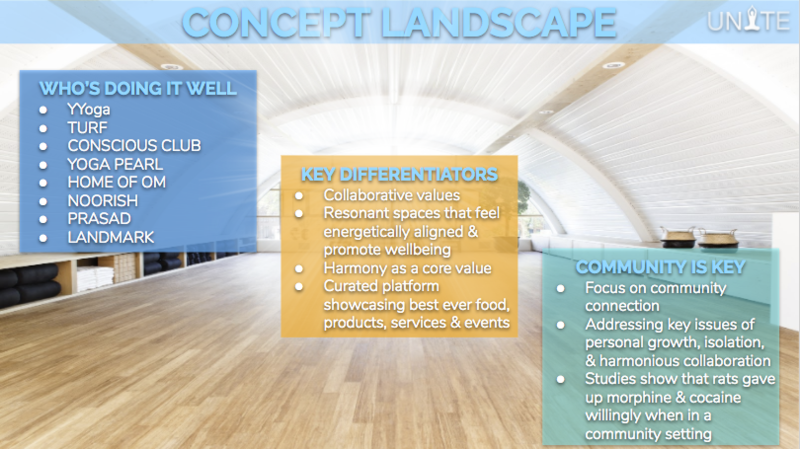 Spaces that UNITE community, coworking, collaboration, education, entertainment, relaxation, personal growth, exercise, mindfulness, yoga, meditation, wellness, healthy food, and more! They will grow a thriving communities, and be a way to support leaders & changemakers to maximize their positive impact on the world & fulfill their vision & goals. 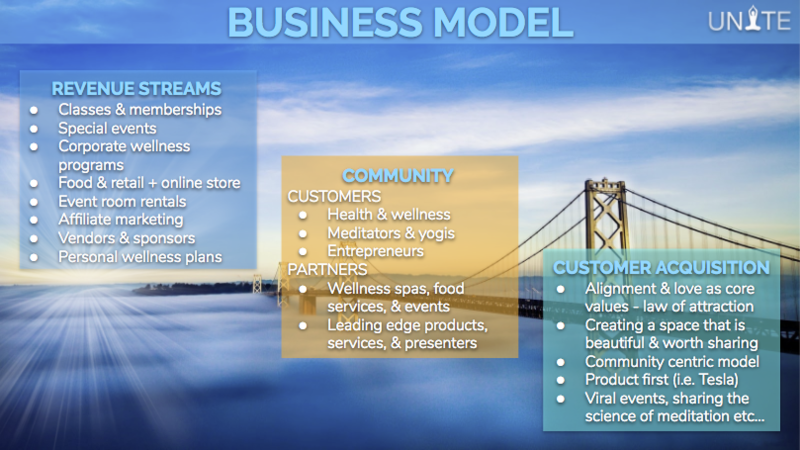 Many business models working cohesively to create a sustainable model. Come for a steam & sauna, stay for a yoga class, eat some food, do some work, watch a movie, and engage in synchronistic conversations. We learned through our Journeys events, that with the right venue, and the right content, an event can become viral, spreading through word of mouth. These events sold out with very little marketing, while others with more of a push fell short. We will create amazing experiences & spaces first & foremost (Tesla has no marketing budget but still reaches many people by creating amazing products). We have a talented team of community members to share, promote, and inspire growth & participation. Click to see a copy of our 2018 Financials and here for a 12 month projections of UNITE CENTRE at full capacity. We are supported by our community and its large reach & diverse resources. 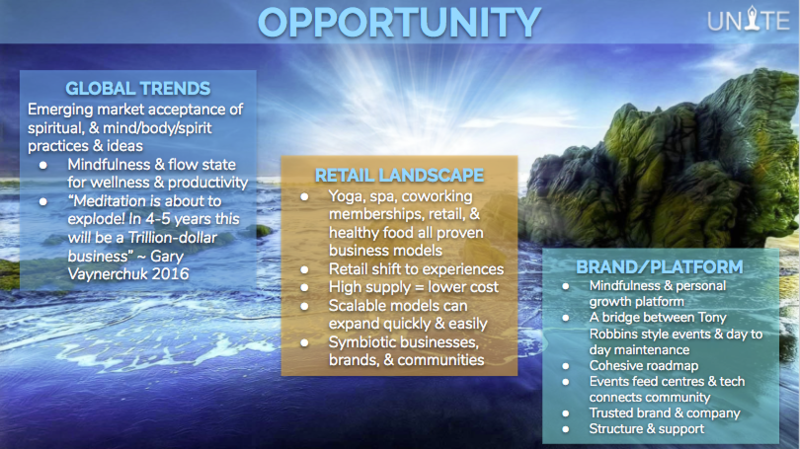 Offering many opportunities to support each other's missions & visions of a thriving, connected world. 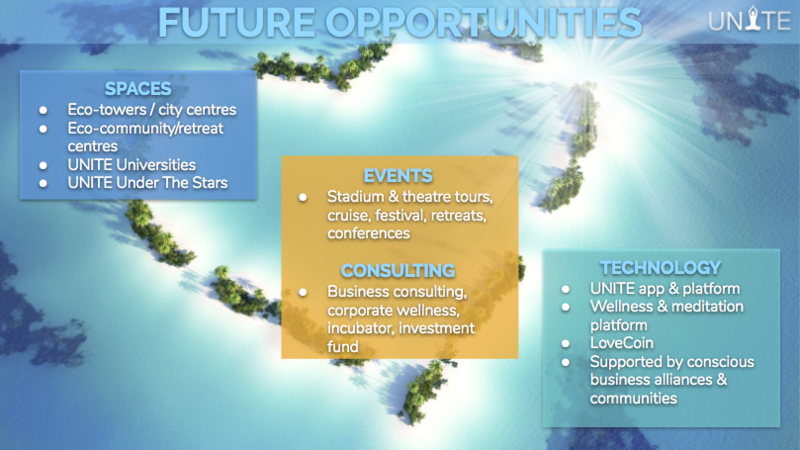 We have big dreams & dream teams to create projects including global city centres, stadium tours, global synchronized meditations & celebrations. 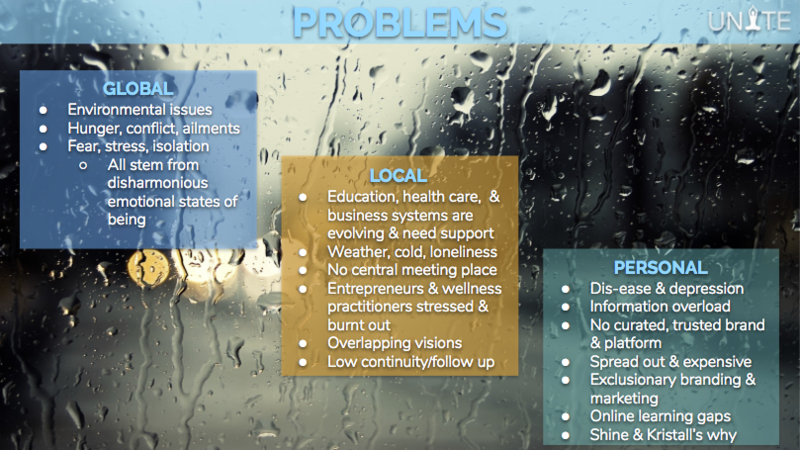 We see technology that connects people with wellness products & services, simplifying people's experience of finding the best tools to help them reach optimal function & flow, and a platform to connect teams & consultants with projects that that serve the greater global good. We are ready to grow! Our team & culture is focused on being unconditionally loving, committed to personal growth & responsibility, & interpersonal harmony. We have a large local community that meets in person regularly at local restaurants, spas, in homes, & larger venues, while we await our community space, our home base of operations, our UNITE Centre! 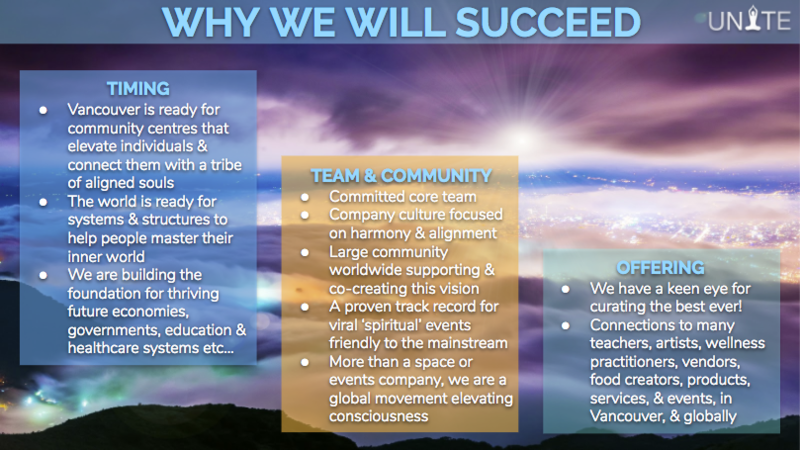 The more than 80 events over the past 2 years, have focused on uplifting humanity through meditation & music, high vibe sober dance parties, networking, & TED Talks style events. Our most popular event, Journeys, at the Vancouver Planetarium sold out all 12 shows so far, with 230 people & 25 local vendors & sponsors per show, showcasing their products & services. 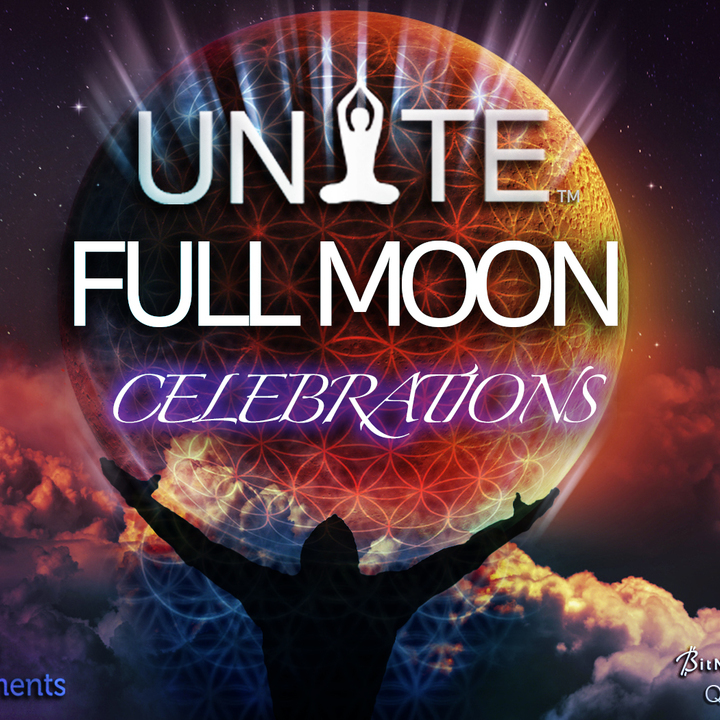 We are excited to continue to offer many more community events, serving as a platform to connect & uplift remarkable people, using our viral, widely popular events to showcase our ‘deeper dive’ experiences, attracting people into our upcoming UNITE Centre, where we will be connecting & running events & more, daily! We offer high vibration events & experiences to connect us with our highest potential, and with others of like mind. We see a THRIVING & UNITED world! We are community leaders; leading by example, dedicated to personal growth & being our best selves, following their highest excitement & interest, supporting community to do the same. 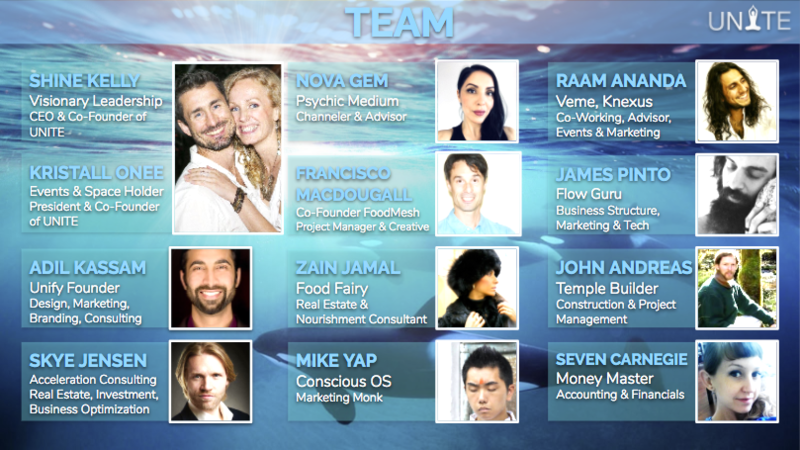 Involved in events ranging from Tony Robbins, Caroline Myss, Eckhart Tolle, Jason Silva, etc. Supporting those going through tough times by engaging and connecting them with others in the community for support. Building a reputation; having heard many times, that people love what they do & will come to anything they put on. Thank you so much for your support! We love you! Please let us know how we can support you! Love!! ~Shine & Kristall and the whole UNITE Team! Many people are lonely, sick, & depressed etc... the world is changing & humanity is evolving. Our community of visionaries & changemakers have amazing tools to support this transition. We need spaces, events, & technology to UNITE & share our community’s many gifts. Offering a platform to create more accessibility to content & more abundance for creators. We are leading by example, fostering a culture of unconditional love, alignment through personal growth & responsibility, & co-creation through interpersonal harmony. 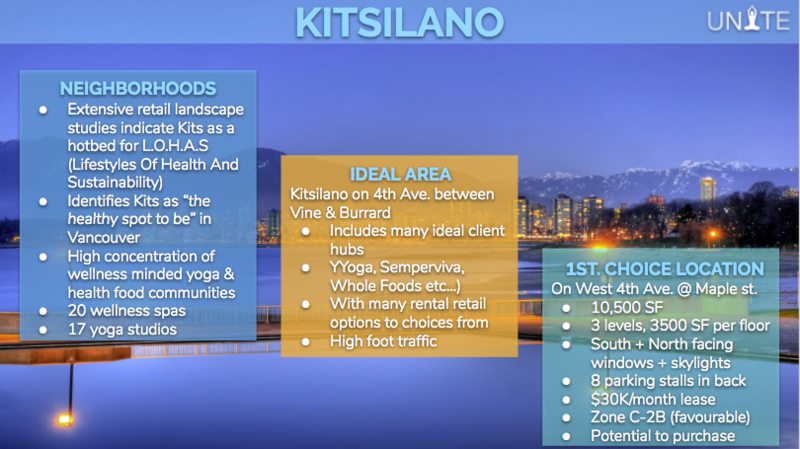 Mix of yoga studio/YMCA/community centre, church/temple, lounge/cafe, & spa/wellness. Focusing on mindfulness, productivity, work/life balance, relationships, wellness, & abundance. Membership model with donation options making it available to anyone. Local events series currently running & expanding to grow awareness & create recurring revenue. Bridge between big Tony Robbins style events, and daily flow-state activation & maintenance. 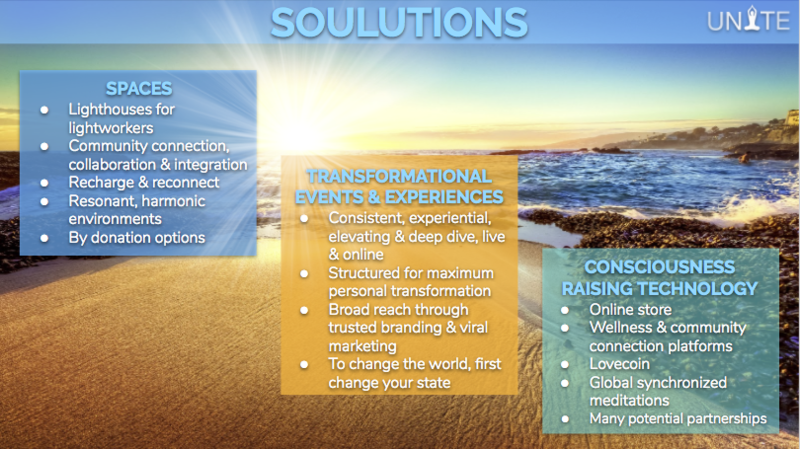 Transformational, curated curriculums (road maps for personal happiness & global evolution). Online store and platform to connect/support communities & reach global scale. Showcasing synergistic businesses for greater expansion & reach. e.g. Knexus Co-Working, Zend Lounge, & Halsa Spa. Working towards community eco-towers with residential, office, & retail space. 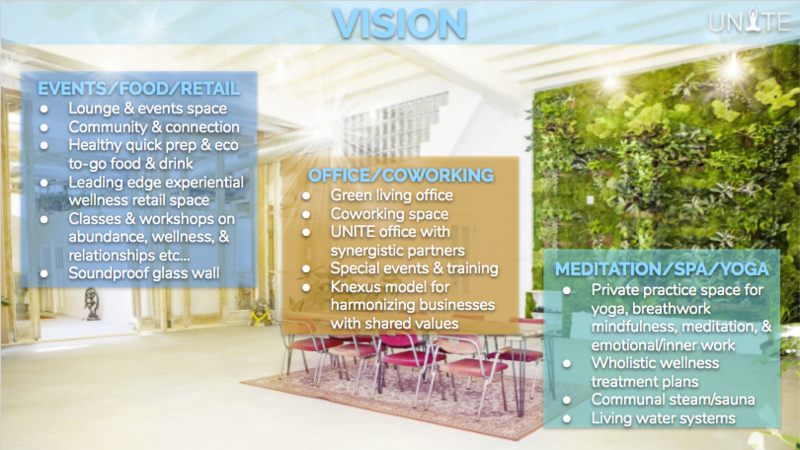 Optional: Spa & Wellness (Massage, Steam/Sauna), Childcare, Co-working, Raw Vegan Lounge. Possible location: 4th & Maple: 10,500 SF, 3 floors, $30K/mo lease, zone C-2B, potential to purchase. Lounge & retail, raw food & smoothie bar with eco-to-go, comfy community seating. Spa with sauna/steam, wellness rooms, & soundproof yoga/meditation space. Create a thriving model & scale globally. In 2 years we have hosted more than 80 events with 6000 participants, reaching 650,000 people, generating $250K & a 2500 person fb group & email list. 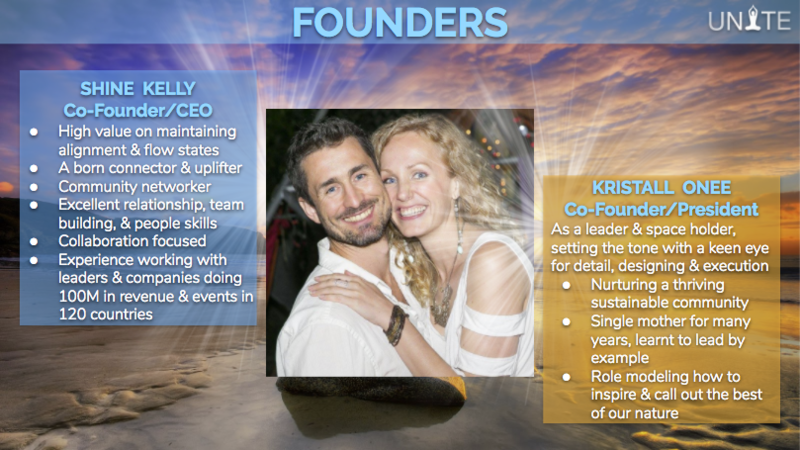 Shine Kelly (CEO), Kristall Onee (President) & a growing team of superstars! Yoga, Entrepreneurial, Spiritual, & Personal Growth Communities (LOHAS - Lifestyles Of Health And Sustainability). We have a solid base of potential team members & customers already. Sponsors & Vendors: Over $50K from sponsors & over 100 local vendors at our events. Partners & Advisors: Many remarkable community & business leaders are behind us. Tickets ~ Memberships ~ Rentals ~ Retail/Food & Online Sales ~ Affiliate Sales ~ Donations. $90K - $250K in monthly revenue once Centre is operational. $90K/mo expenses per month. 1.6M in expenses to open within a year. 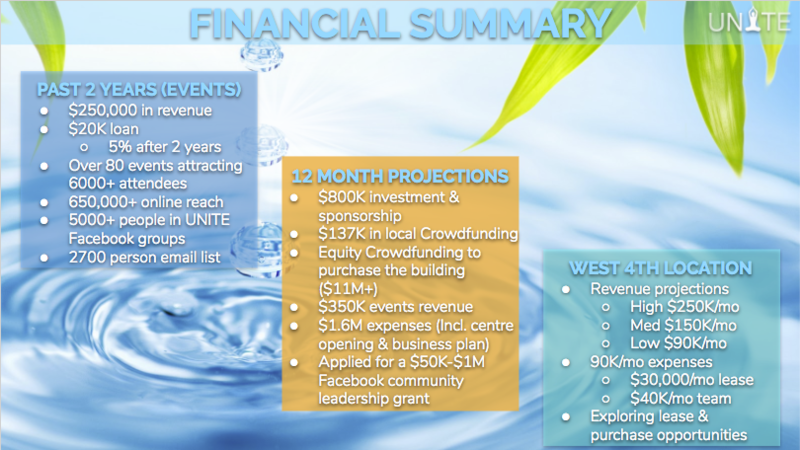 Local Crowdfunding launching in April to raise up to $125K by June. Local events to bring in $350K in revenue at 25% profit margin by Nov. 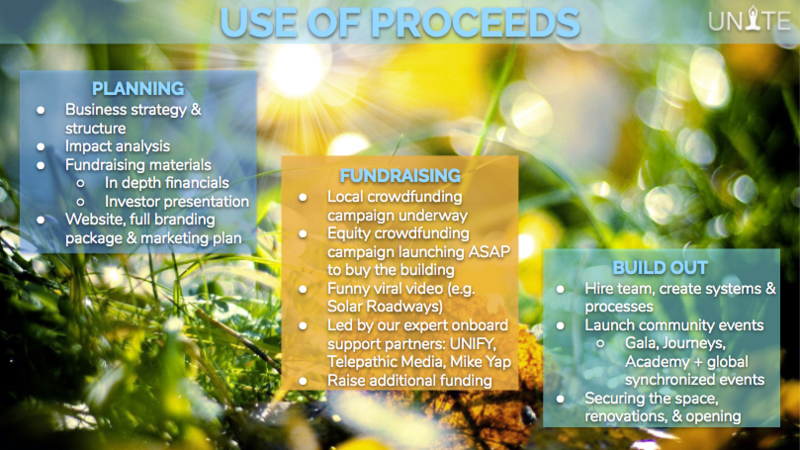 Global Equity Crowdfunding Campaign being explored, with potential to buy the building. Supported by our expert onboard support partners: UNIFY, Telepathic Media, & Mike Yap. 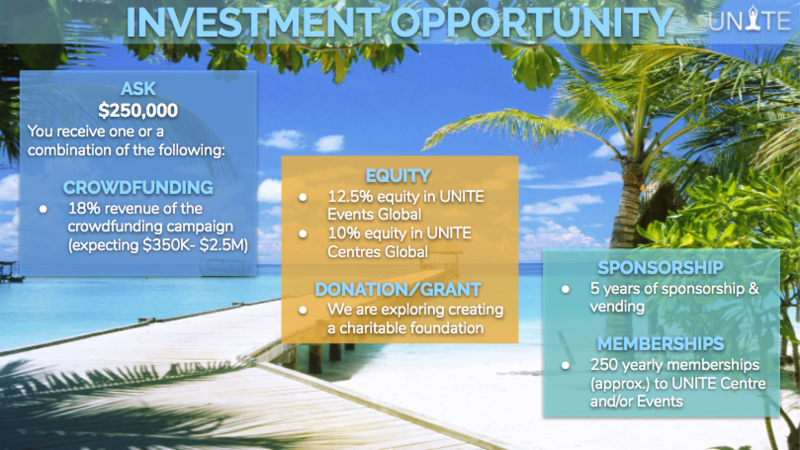 Investment & sponsorship from aligned partners up to $800,000. UNITE may receive a $50K to $1M Facebook Community Leadership Grant starting in June. Applying for Telus & LUSH grants and exploring many other avenues. $60K for Legal, Accounting, Business Plan, Branding & Marketing Strategy, & Website. $150K for Team until Nov.
$180K for Events & Marketing until Nov.
Social Media ~ Viral Content ~ Viral Events ~ Video ~ Influencers ~ Email ~ Word of Mouth. Viral Events ~ Crowdfunding ~ Consulting ~ Centres ~ Tech ~ New Markets. 10% Equity in UNITE Centres Global (Parent co. for Centres). 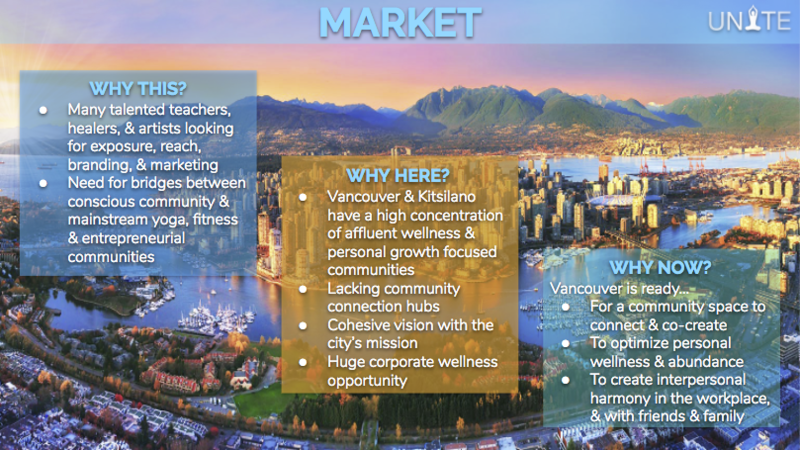 $1.2M/centre per year (YYoga revenue) 350 cities @ 3/city = $1.2B Rev. 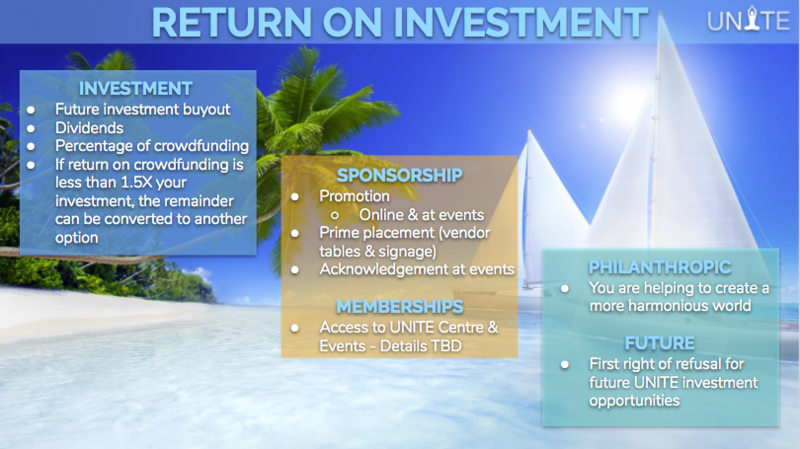 12.5% Equity in UNITE Events Global (Parent co. for Events). e.g. Cirque Du Soleil $800M Rev. (Funny viral video, with expert support, e.g. Solar Roadways) . 250 yearly memberships (approx.) to UNITE Centre and/or Events . 5 years of Sponsorship & Vending (starting now, till 3 years after opening). Promotion at centre, events, & online platforms. 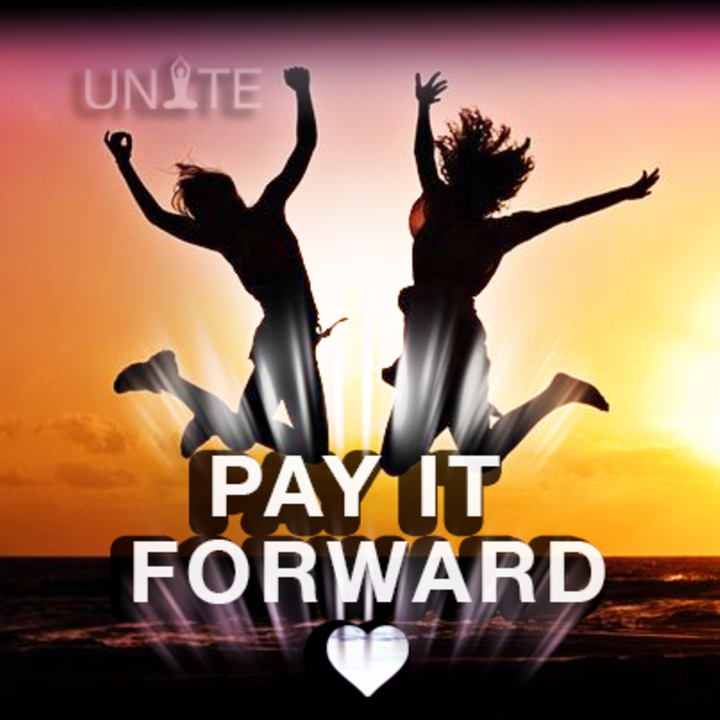 Offer of a Donation or Grant to UNITE (We are exploring a charitable arm). Exit Opportunities: % of crowdfunding, future investment buy-out, dividends. First right of refusal for future UNITE investment opportunities. Supported by our expert onboard support partners: UNIFY, Telepathic Media, Mike Yap. Refine the business strategy, structure, impact analysis, fundraising materials, website, branding & marketing strategy, build our team, & create our systems and processes. 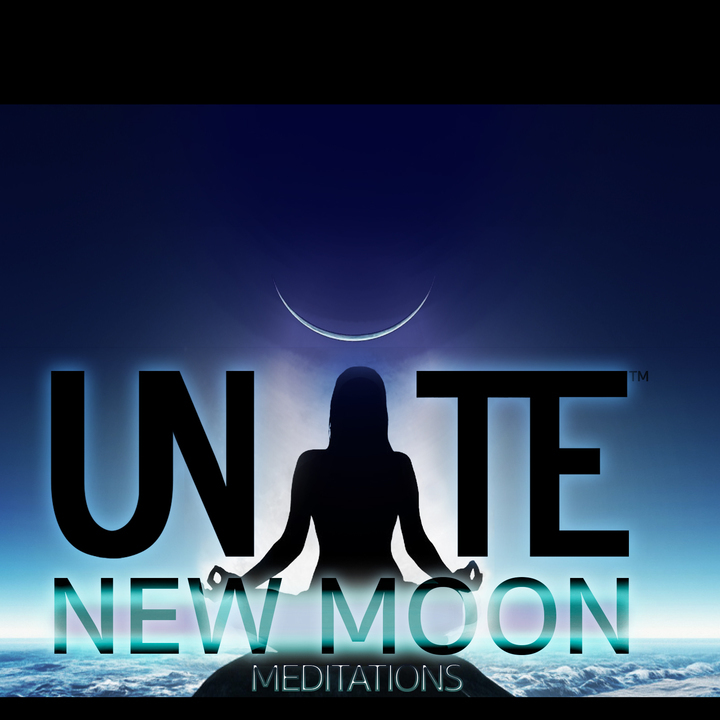 Pre-Crowdfunding Campaign beginning in March, & launching in July, payout in Sept.
Events: GALA, JOURNEYS, UGASM (UNITE Group Alignment & Synchronization Meditations, ACADEMY, UPLEVEL, CONNECT, FULL & NEW MOON CELEBRATIONS & MEDITATIONS, CRUISE, & VANCOUVER (global synchronized events). Events - Stadium & Theatre Tours, Cruise, Festival, Retreats, & Conferences. Consulting - UNITE ELEVATE (Consulting, Corporate Wellness, Incubator, Investment Fund). Spaces - Universities, Under The Stars, Retreat Centres & Eco-Communities. 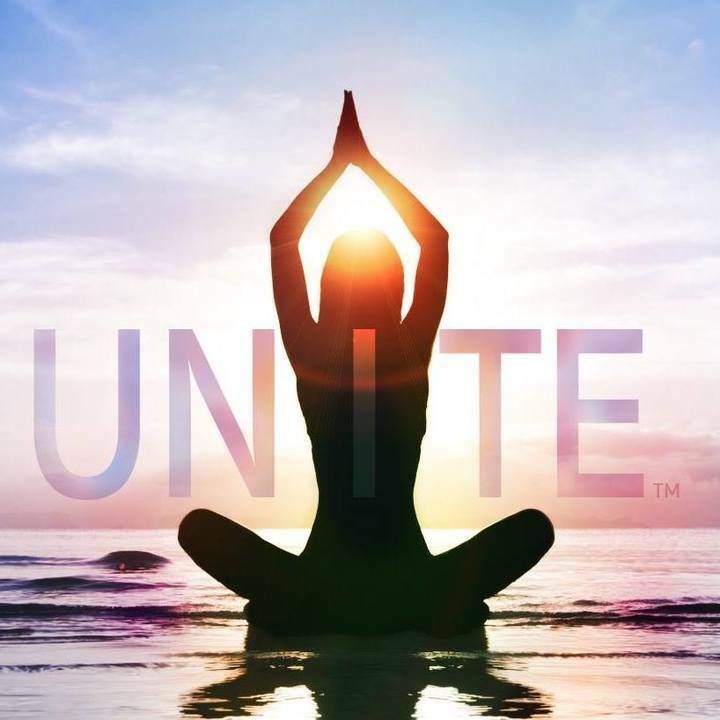 Tech - UNITE & LoveCoin (wellness/community collaboration & connection platform & currency). Let’s UNITE & Light up the World! IMAGINALS are transformational agents here to uplift humanity & elevate consciousness, creating a world we can only now imagine! However, these imaginal cells were created to facilitate this transformation, and are well equipped to survive & eventually thrive, becoming the butterfly they were meant to be. As IMAGINALS, we may have felt like outsiders, been teased, even persecuted. But we were born to create a more harmonious, sustainable, peaceful, & love-filled world. IMAGINALS can tend to stick together, even look to escape the world, going into nature, and retreating to isolated communities. The world is an ecosystem, a collection of villages, and IMAGINALS are like shamans, the visionaries & truth holders. It’s as if many of the shamans have left their villages, creating their own safe havens, away from most of humanity, skewing the balance. The role of the shaman was always to bring the wisdom back to the tribe. For bread to rise, the yeast must be distributed evenly. Our “conscious community” is amazing, and one of our biggest limiting factors, is that we tend to be separate from the very people who need us the most. This manifests itself as many IMAGINALS offering their gifts to other IMAGINALS, but the web is too small, and there is not enough financial flow between us. We believe this is by design, as we are here to uplift the whole. The time has come to UNITE. 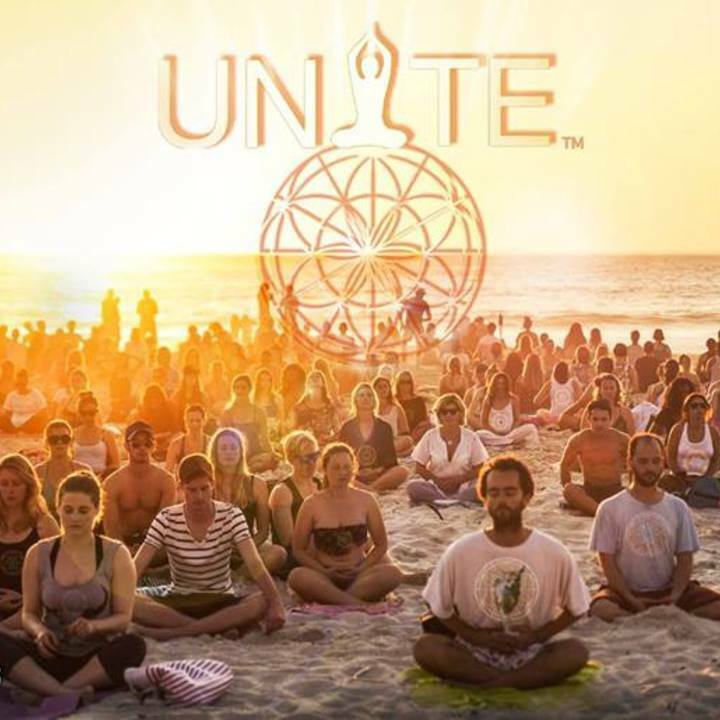 We are creating UNITE CENTRES all around the world, starting in Vancouver, that will showcase our tribe, and all our gifts, in a way that is easy to access for anyone. Spread that model around the world, eventually leading to eco-community towers & retreat centres where we can all live & play together! These spaces will act as community hubs, & training centres, giving people a place to do regular inner work & connect daily to spark co-creation. Create a series of uplifting, inspiring, & viral events, leading to a global synchronized stadium & festival tours UNITING BILLIONS around the world. These events will be mainstream and funnel people into UNITE CENTRES. Through our Journeys events at the Planetarium we were able to reach a mainstream audience, selling out every show, & connecting people with amazing experiences, products, & services. 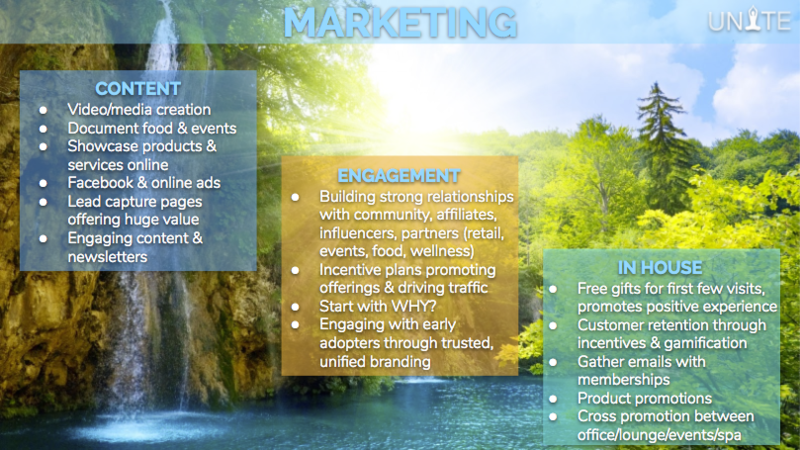 Create technology platforms for showcasing & connecting people to sustainable wellness products, services, & events world wide! As IMAGINALS, we carry within us, the seeds for a bright new future. When we are full, of life, love & happiness, we have an overflow of energy that positively impacts the world and those around us. Our work then is not to solve problems, but to lift ourselves and each other up, being examples of positivity & abundance, supporting those who may come into our field if in the flow for the highest good of all. We see how depression, illness, mental health challenges, and other personal issues affect not only the individual, but all of their connections, and ripple outwards. In effect, so too can happy, aligned people have an exponential impact on those around them, and the world at large. We believe that if the entire world learned how to be consistently happy, to forgive, to harmoniously transmute limiting thoughts, emotions, and beliefs, and to love ourselves, each other, and all of life, unconditionally, that we would see peace on earth, and experience a heaven-like, thriving world, the likes of which we could only dream. We believe that all problems, big or small, stem from emotional states of disharmony, and that once we learn to master our state of being, we will become conscious creators of our reality, attracting what we truly desire, creating a world of love, peace, and harmony. We believe that all souls are born into this world from a state of pure love, and learn from our environments. Often, we take action from emotional states of being, in response to our patterning & the world around us. We believe all beings are inherently ‘good’, and that within each of us is a seed of love, that only requires some attention and care to bring it into blossom. Dr. Bruce Lipton says that at least 95% of all diseases are caused by stress, and the other 5% are genetic, and were caused by stress in the lineage, and can be changed through shifting thought patterns and states of being. Stress is a choice of how we choose to respond to a situation. Therefore we are 100% in charge of our health and wellbeing, and we believe we also attract into our experience that which we are a vibrational match to, meaning that if we feel bad we will attract more bad feeling experiences, and feeling good attracts more good feeling situations. Challenges also come up as we are called to increase our capacity to create; a new job or relationship can often bring up old patterns that must be released in order to thrive in this new reality. Without the tools to successfully navigate these situations we can live believing we are at the mercy of fate, or other people, and that we have little to no control in our lives. Divorce, suicide, & depression rates are indicative of this discord. Often, when we are ill or depressed, we have less to give others; so too, when decision makers are not aligned, it can create situations that seem to be win/lose rather than win/win for people and planet. Many of us learned these patterns from each other, and from our past programming. We can choose to shift them into harmonious thoughts, beliefs, and states of being, that can usher in a new age of abundance, prosperity, flow, and alignment for all. When we as a society engage in distractions (phones, TV, etc…) we are dissociating from reality. These practices can be self destructive if not paired with tools to align with and harmonize our existing reality (e.g. hating your job or your marriage). To create a more harmonious reality we must learn how to master our inner world, and our focus. Being with others of like mind, and learning from those who have achieved mastery in such practices is a great way to do so. The tools we need to create a joyful, sustainable world are all around us. The only limiting factor is ourselves, our states of being, and our limiting beliefs. J oin us in this movement to UNITE humanity, & connect each other with the tools to create a harmonious & joyful world. IMAGINAL ENTERTAINMENT INC. hasn't posted any updates yet. This perk includes a HUGE hug next time we see you! IMAGINAL ENTERTAINMENT INC. is managing the funds for this campaign.